As Lindsay Scott's family braced for the government shutdown, she was offered financial assistance from an unlikely benefactor: her 11-year-old son tried to donate his saved allowance to his parents. Scott’s husband, who declined to be named, is an active duty Coast Guard member stationed in Maine. An emergency payment to active duty Coast Guard members was issued on Dec. 31, but the next paycheck remains very much in doubt. The Scotts didn't take their son’s money. Instead, they turned to their bank, USAA, like they have during previous shutdowns. The couple keep their checking and savings accounts with the military lender, as well as their rental and car insurance. They’ve been customers for 10 years. "In the past, USAA has always stepped up and said, 'we're not going to make you go without pay, we will push paychecks through, if you bank with us, we've got you taken care of,'" Scott told ABC News. "This time USAA did not. The United Services Automobile Association (USAA), a San Antonio-based company is one of the largest banks to serve the military. But this partial shutdown of the U.S. government, now in its 13th day, has many Coast Guard members who are USAA customers questioning the company's self-proclaimed values of "Service, Loyalty, Honesty and Integrity." In several interviews with ABC News, as well as on Twitter and USAA's Facebook page, Coast Guard servicemen and their families say that they feel betrayed by the military lender. “They waited and waited and waited until the last possible second. People were calling, and emailing and finally after a week and a half, they said, ‘We can offer you the opportunity to apply for a loan with interest.’ None of the other military banks are applying interest. And they didn't add interest when the other military branches were affected. So it felt very much like Coast Guard is not as valued as the other branches are." Unlike other military branches, which are run through the Department of Defense, the Coast Guard is part of the Department of Homeland Security, which is not being funded during the shutdown. The federal budget is being held up over congressional Democrats and President Trump over his campaign promise to build a wall on the Mexican border. In the past, USAA, like other banks which primarily serve the military, offered to float its customers' paychecks during a government shutdown. In other words, it offered a zero-interest loan to service members until paychecks resumed. But this year, USAA has declined to do so. 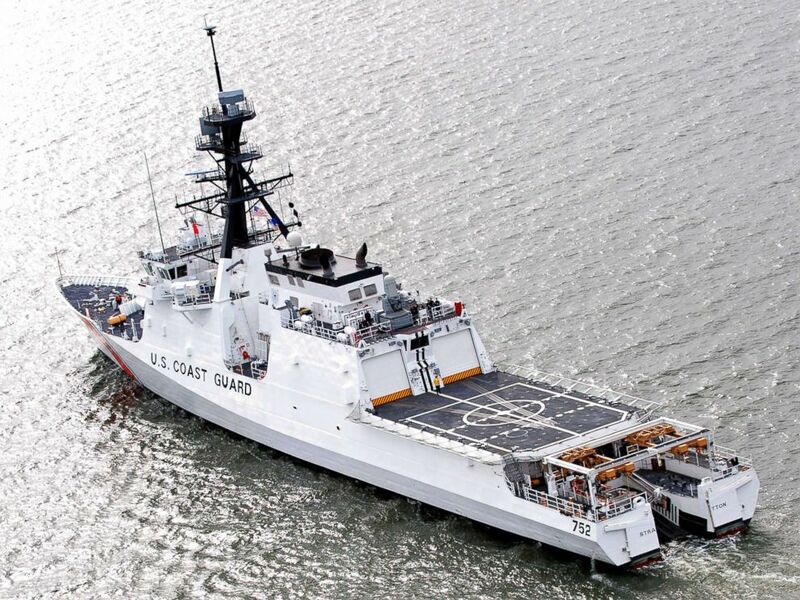 An undated stock photo of a U.S. Coast Guard ship. Credit checks by financial institutions can lower a person's credit score, particularly if many are done at the same time, and flag that a person may be high-risk. One inquiry may not cause a huge drop. A spokesman for USAA confirmed to ABC News in a phone interview it has discontinued offering zero-interest loans to service members this year and is instead offering a one-time loan at a 0.01 percent interest rate, payable over 12 months. He added that this was because the company had redesigned its services in order to plan for longer and recurring government shutdowns. The Navy Federal Credit Union, in contrast, told ABC News it was prepared to front zero-interest loan paychecks for its members. A one-time emergency payment for Navy servicemen was negotiated for Dec. 31 by politicians, so what will happen on the next payment date, Jan. 15, remains to be seen. USAA denied it was singling out the Coast Guard. "We have heard comments that some Coast Guard families feel like we are discriminating against them. This is most certainly not the case," a spokesman wrote to ABC News in an email. Scott and her husband were turned down for a loan from USAA, even though, she said, they have "good credit." "I don't personally know nor have I seen a single person who has applied and been approved," Scott said. She is part of an active community of Coast Guard spouses, and many have been sharing their experiences with USAA in person and in a Facebook group. "It comes across like they offered up something at the last minute, and it was an empty offer," Scott said. In a follow-up email asking for data on how many loans had been applied for, how many were granted and what the credit requirements are, a USAA spokeswoman wrote in an email to ABC News: "We aren’t able to share the specific numbers of loans that have been applied for or the number that have been approved. We can confirm that the number of applications has slowed since the confirmation of Coast Guard pay was announced last Friday, Dec. 28." "In order to protect our members’ privacy, we cannot release details on individual loan applications. We advise that the members call us to discuss their situation and to see how we can best assist them," the statement continued. On Thursday, the Consumer Financial Protection Bureau (CFPB), a Federal watchdog agency, announced that it settled with USAA on a separate matter: failing to honor consumers’ stop payment requests on electronic fund transfers and for reopening closed deposit accounts without permission from the account holders. As a result, USAA must pay approximately $12 million in restitution to affected consumers and a $3.5 million civil penalty." In a statement, USAA said that it had "been proactively addressing these issues for more than a year and most are resolved. In 2017, we began providing restitution payments to some affected members, and improved our procedures. None of the issues reflect an intention to take advantage of our members. In fact, we believed our processes would help resolve matters faster. We take responsibility for this situation." Natalie Daniels, 30, is married to a Coast Guard member who is stationed in San Diego, where the cost of living is particularly high. She told ABC News that when she called to apply for a loan, before the emergency payment was issued on Dec. 31, she was told she didn't qualify because she already had an auto loan with USAA. The financing for the family's car "would automatically opt us out of the opportunity to get a loan," Daniels said, adding that she has a credit score of 725. Daniels also said that other vendors had offered grace periods for late payments for services, but USAA had not. "They said we could stop auto pay, but we would get late fees and charged interest." "We are all one big family," Daniels said of the Coast Guard. "We shouldn’t have everyone going into debt, using their credit cards with interest variables because the government can’t get it together."